Yamanaka Suwa Shrine(山中諏訪神社) and Yamanaka Sengen Shrine ( 山中浅間神社) are located right next to Lake Yamanaka and Mt. Fuji. Yamanaka Suwa shrine is known as the shrine for safe baby delivery and having baby. Many people visit this shrine for their babies. In Autumn, they have great Autumn leaves in their garden. Nice to see koyo with Mt. Fuji. Yamanaka Suwa Shrine is one of the oldest shrine which built in 104 by the order of Emperor Sujin for saving people form plague. In 966, Emperor Murakami rebuilt this shrine for all pioneers and named Suwa Shrine. In 1552, Takeda Shingen build new building for his success of winning against Hojo. After that, around 17th century, people visit here for safe baby delivery. In September, there is Matsuri for safe delivery. Yamanaka Sengen Shrine is built in 931. 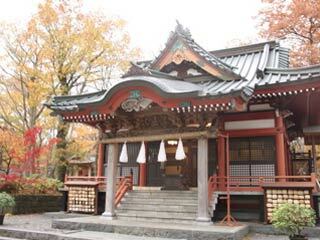 It enshrines Konohanasakuya, Amatsuhikohikohoninigi, and Oyamagi.